I continue to volunteer regularly onboard Big J and always take plenty of photos whenever I'm there. On this page you'll find links to photos taken since the ships Grand Opening on October 14, 2001. If you would like to see photos from another period in the ships long and distinguished career, click Here to go to the Photo Gallery Main Page and select a link for the time period you want to see photos from. If you'd like to see photos of a specific area of the ship, click Here and describe the area in an e-mail. I'll try and take some photos of that area for you the next time I'm onboard. 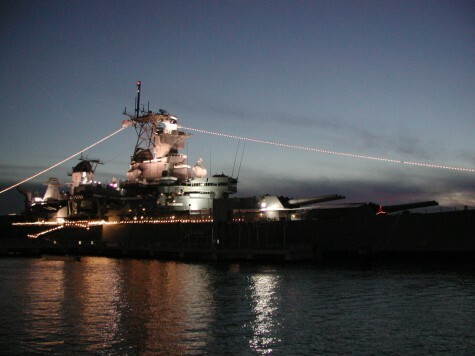 Photos showing the ship decorated with lights for the holidays. Photos from volunteer days during the past 9 months. Photos from volunteer days during the past 4 months. New Tour Route into the lower levels of Turret #2 to open soon - The work is just starting! Bricks are being installed on the Pier - Fireworks over the Delaware River - Happy New Year!! SS United States looking pretty sad - USS Olympia to remain open until Spring "Summit"
Trip to a Flying Circus in Bealeton, VA to watch vintage biplanes do amazing things, great day! Chesapeake Bay cruise on the S.S. John W. Brown, and a snapshot in time, what a treat! Looking for Tattoos done by Sailor Jerry in Honolulu, any stories to tell?